The GX-2i3 with Leupold's high-performance DNA (Digitally eNhanced Accuracy) engine and advanced infrared laser provides faster measurements and increased accuracy displayed to the nearest 1/10 of a yard. Featuring True Golf Range (similar to slope features) which can be disabled for tournament play per updated USGA rule 14-3. 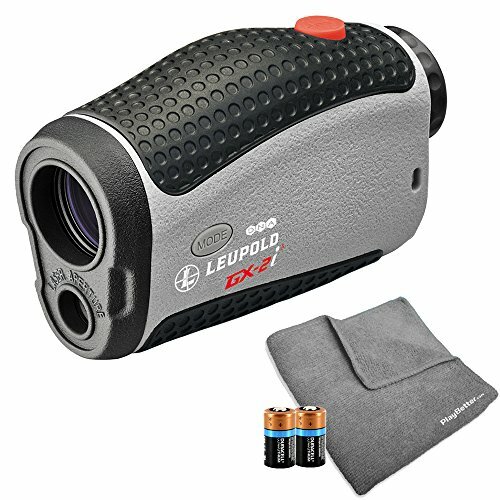 6X MAGNIFICATION - Utilizing Leupold's high performance DNA (Digitally eNhanced Accuracy) the 2i3 offers 6X magnification with accuracy to 1/10 of a yard! PINHUNTER 2 & PRISM LOCK TECHNOLOGY - The key to fast, accurate ranging is the ability to lock on to the flagstick. Our improved PinHunter 2 Laser Technology filters out background images and makes zeroing-in on the target faster and easier. PINHUNTER 3 & PRISM LOCK TECHNOLOGY - The key to fast, accurate ranging is the ability to lock on to the flagstick. Our improved PinHunter Laser Technology filters out background images and makes zeroing-in on the target faster and easier. PERFECT BUNDLE - the PlayBetter Microfiber towel will keep your GX-2i3 lens clean while the extra battery will make sure you're always in action, even after long weekends of golf!